On October 24, 2015, the Day of the Synaxis of the Optina Starets, His Holiness Patriarch Kirill of Moscow and All Russia, visited the St. Ambrose Hermitage of Our Lady of Kazan at Shamordino. This year the convent founded in 1884 by St. Ambrose, an Optino Starets, marks the 25th anniversary of the resumption of monastic life in it. 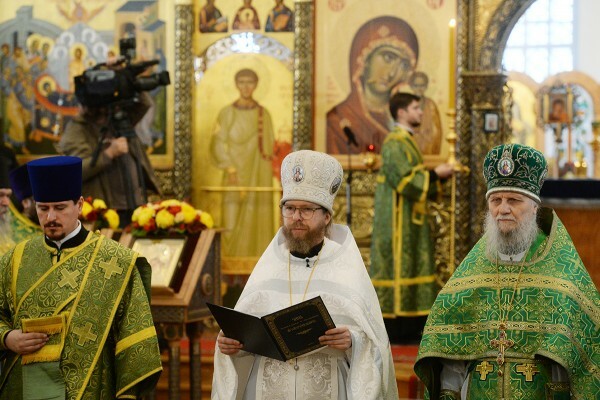 The Primate of the Russian Orthodox Church led the congregation in celebrating the Divine Liturgy at the main church of the convent, the Cathedral of Our lady of Kazan. During the liturgy, Archimandrite Tikhon (Shevkunov), abbot of the Sretensky Stauropegial Monastery, was consecrated as Bishop of Yegoryevsk, vicar of the Patriarch of Moscow and All Russia. His Holiness was assisted by Metropolitan Hilarion of Volokolamsk, head of the Moscow Patriarchate department for external church relations (DECR), Metropolitan Clement of Kaluga and Borovsk, chairman of the ROC Publishing Board; Metropolitan Longin of Saratov and Volsk; Archbishop Maximilian of Pesochnya and Yukhnov, Archbishop Feognost of Sergiev Posad, head of the synodal department for monasteries and monastics; bishop Sergiy of Solnechnogorsk, director of the Moscow Patriarchate administrative secretariat; Bishop Nikita of Kozelsk and Lyudinovo; Archimandrite Anthony (Sevryuk), who has been elected as Bishop of Bogorodsk; Archpriest Vladimir Divakov, secretary to the Patriarch of Moscow and All Russia; Schema-Archimandrite Iliy (Nozdrin); the convent’s clergy, monks of the Optina Hermitage’s Monastery of the Presentation of Virgin Mary in the Temple and the Optina Hermitage and the Sretensky Monastery; as well as clergy from several dioceses of the Russian Orthodox Church. Present at the service were Kaluga Governor A. Artamonov, Kaluga Regional Assembly Speaker N. Lyubimov, and Ms. Ye. Slabova, head of the Kozelsk City Administration.